As long as I’ve been doing this travel thing, I’ve kept a running list of places I want to visit… and the list is always growing. That list generally includes boutique hotels, cafés and exotic new cities I haven’t visited yet. To an extent, I’m always planning ahead for my next trip. So what takes a trip from brainstorm to actual reality? When I buy the flight. Flights are generally the most expensive purchase on an international trip, and they drive all your other travel plans. These days, there are a phenomenal amount of online resources dedicated to buying cheap flights, and many of them offer similar features. However, I tend to be brand loyal… and my flight search engine and research tool of choice has always been Kayak. I like Kayak because the interface is clean and easy to use on a computer, tablet or phone. Most importantly, Kayak offers a plethora of awesome (and free) features that will tell you everything you need to know about your flight… and when it comes to saving as much money as possible on an international flight, knowledge is power. Choosing the right day to buy. 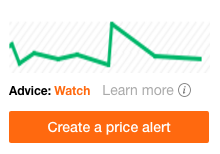 First, Kayak allows you to set up a price alert between as many locations as you want. Go ahead and do this now. You’ll get daily emails with the flight price, and when it falls, you’ll be the first to know. There’s a bit of a science to buying flights on the best possible day, and not all the travel writers I keep up with agree on what the science says. Kayak makes this science simple. In addition to flight alert emails, Kayak will show you a graph of any flights you search that says how confident the Kayak wizard (or likely the Kayak algorithm) is that you should buy the flight today. It will also show you a graph of the price trajectory over the past few months, and you can see if it has steadily increased, or just fell to its lowest point in the past 4 months, or is hanging out somewhere in the middle. Choosing the right day to fly. Another important Kayak feature is the + / - 3 days tool. When you are still in the research phase (prior to requesting time off work), go ahead and search your flights with the plus-or-minus-three-days option selected on both legs of the journey. Prices will display in a grid, showing the cheapest combos of days to leave and days to return in green (while more expensive options will be shown in red). Generally (but not always), flying in the middle of the week will be the cheapest option, but this grid feature will tell you the exact combination of travel days which will save you the most cash. One of the most important flight hacks for those of us balancing travel and a career is to book multi-city flights. When you are working with a limited number of available travel days but are planning to visit more than one city on your trip, the most efficient option is generally to fly into one city and out of another. This way, you don’t have to waste vacation time (and transportation money) at the end of your trip traveling back to the city where you started, just so you can fly home. Some examples of multi-city flights I’ve taken over the past few years include a flight into London and out of Edinburgh in September 2014, a flight into Tokyo and out of Seoul in April 2015 and a flight into Edinburgh and out of Dublin in May 2016. Kayak’s multi-city flight building tools are good, but their analytical tools are not as robust as those for the strictly round trip flights (flying into and out of the same city). In order to put an alert on a multi-city flight, I usually set up alerts on round trip flights into both the city I’m flying into and the city I’m flying out of, and when prices on both of them fall simultaneously, then it’s buy time. Depending on the cities covered by your multi-city flight, the flight price may be higher than a strictly round trip option. If you are tempted to revert to a round trip flight in and out of the same city, make sure to compare that price including the transportation cost of getting back to that city with the price of the multi-city option: is it still cheaper? If so, consider the time cost. If traveling back to your original arrival city via another form of transportation is cheap and relatively fast, that may be a case where you would pass on the multi-city flight. In my experience, these added time and financial costs don’t outweigh the slightly increased price of the multi-city flight in most cases, but it all depends on where you are going! Remember to always check your multi-city flights in the opposite direction. I’ve recently seen a flight into London and out of Paris priced $200 cheaper than a flight into Paris and out of London. Down to the Wire? Buy the Flight. The above options all cater to a perfect world, where hypothetical you has enough lead time to do plenty of research and score an overall awesome deal on a flight. If you are anything like me, travel planning doesn’t always work out that way. I’ve been in that gut-wrenching, horrible situation where the flight was $300 cheaper yesterday, but I didn’t buy the flight. There is a point in the life of every flight where the price is not going to decrease from today on… and the best thing you can do in that situation is just buy the flight. Ultimately, there are human factors to planning a trip, and one of the biggest is getting your fellow travelers on board. Then getting your own and all your fellow travelers’ vacation time approved. Then mutually deciding on the perfect flight. Then purchasing said flight. The above tips for buying on the right day, flying on the right day and choosing the right multi-city flight will help you save money when you have plenty of time to plan ahead. However, sometimes, you won’t have that time. There will be trips where you don’t get the best possible price on a flight… but I still think that you should go. Personally, I use points to supplement flight prices when I’m down to the wire, and I focus on saving money on stays. There is a whole world of strategy about saving money on flights with points that would be several blog posts by itself, but I’ll leave that to the experts (check out this site to learn more). Additional Resources: This Guide is by far one of the most comprehensive flight-buying guides I've found. They also bring up a lot of online resources not mentioned above. Check it out before buying your next flight!